I never thought I would post anything like this. I'm the girl who used to feast on cheeseburgers and bacon cheese fries. My mom, a registered nurse who knew her stuff, always taught me the importance of consuming meat to make sure I got enough protein, the big kahuna of nutrients. Honestly, we used to judge vegetarians for being “too good” to eat meat. I was raised to eat whatever you're given, whether it's a pile of turnip greens and pinto beans, or a gooey homemade chicken casserole, or a cheap can of pork-n-beans. We should be grateful for any food that's ever placed in front of us; we should never complain, never protest. That's Biblical teaching. And hey, while we're on that subject, didn't God also specifically say multiple times in the Bible that animals were for humans, the rulers of the earth, to eat? There are so many reasons why going vegetarian seems crazy for someone like me. But now that I'm an adult, finally out on my own, buying my own groceries, cooking my own meals, I realize I'm making my own choices. I don't eat what someone else cooks for me. I alone am responsible for the food I eat. And that has caused me to question a lot of things. 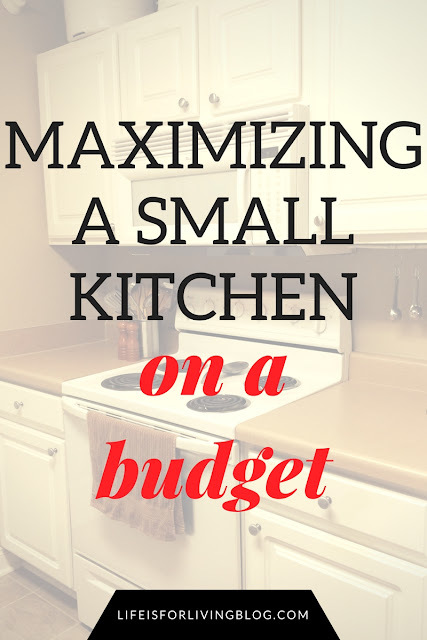 After losing nearly sixty pounds and still having thirty more to go, I have adapted the contents of my refrigerator and pantry to suit a healthy lifestyle. I don't bring home Dr. Pepper or Doritos or Oreos or Lucky Charms any more; I eliminated all the obvious junk food. Then after doing some research, I've cut out nearly all processed foods labeled and marketed as “healthy” and have opted for a clean, natural diet. I've noticed that as a result, I don't eat as much meat, and very rarely red meat. So many of the reputable health sources (actual medical research, not somewhat shady studies backed by PETA and the like) I've been studying have preached the benefits of implementing more meatless meals and restricting meat consumption. So I joined the national campaign of Meatless Mondays. And I liked it, because I prefer cooking without meat. Handling raw chicken, beef, and especially pork has always grossed me out almost to the point I can't eat it when it is done, so it became nice to not have to deal with that on meatless days. That's when I realized something. If I think it's so gross, why am I eating it? Ethical and spiritual views aside, when you stop and think about meat, it's pretty disgusting. Really. It's muscle. And those white tough bits are tendons and ligaments that once held those muscles onto the bones of a living, breathing, moving animal. Sorry to bother your stomach, but it's true. Yet we choose to force that truth from our minds because we like the way fried chicken and hamburgers taste. And that set off a whole new chain of thoughts for me. Should I partake of something that is: 1) kind of gross, 2) scientifically proven to be unnecessary and possibly even detrimental to our health, 3) dismembered body parts of a creature that once contained life? All because, when it's cooked the right way, the taste pleases my taste buds? As a follower of Jesus Christ, this is where it started to bother me. Feeling that something might be wrong but doing it anyway because it pleased my body? The idea of eating meat began to feel a little too much like sin. I started to feel something like conviction, but I decided to ignore it. After all, everyone keeps telling me the Bible says God made animals for us to eat (well, except lovable little cats and dogs. And ugly ones like rats and bats. And wild animals like elephants and zebras and giraffes.). And I'm pretty sure I remembered reading that back in the Old Testament somewhere. So I pushed these bothersome new thoughts from my mind and went on eating chicken and fish. I became pen-pals with a kind, intelligent, Jesus-loving girl who lives on the other side of the United States. I learned she was a vegetarian. “For spiritual reasons”, she told me, when I kept being nosy. I asked her to share these reasons with me, because the idea intrigued me, especially after the thoughts I'd been having recently. 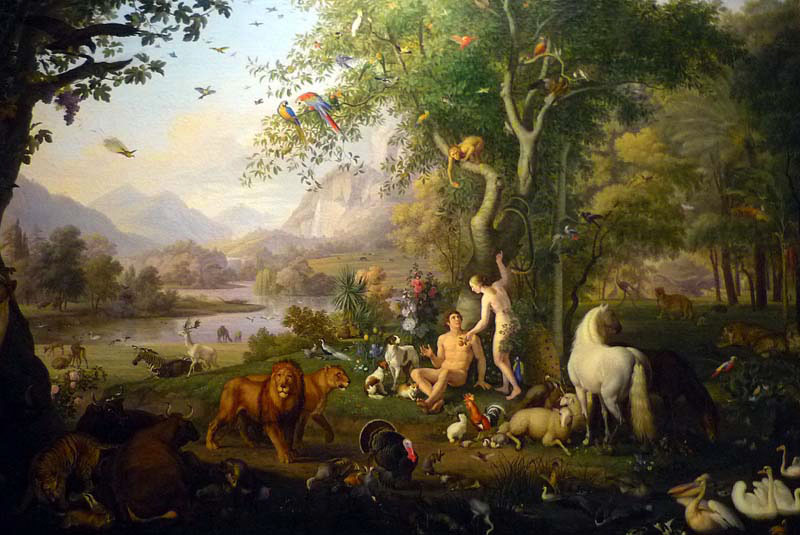 She told me about God's original plan for humanity, how God gave the animals to Adam and Eve as companions, how plants were given to all living beings, man and animals, for food. Then after the flood, for a reason that is not given in the Scriptures, God suddenly told Noah that a select few of the animals could be eaten. But His original plan did not involve the death of animals. That's why she chooses to be a vegetarian, because she feels that it has always been God's plan for us. I'd never heard it put like that before. And I knew she was right. I hadn't read Genesis in a while, but I was pretty sure all that was in there. Feeling the Spirit at work within me, I had to consult my Bible. I began with the first chapter of Genesis. In the beginning, God created the heavens and the earth, light and dark, land and water, sun, moon, and stars, night and day. Then He had a big, beautiful space to fill up, so he made fish for the sea first, then birds for the sky, then livestock, wild animals, and small animals that scurry upon the ground. He told them all to be fruitful and multiply. "Then God said, “Look! I have given you every seed-bearing plant throughout the earth and all the fruit trees for your food. And I have given every green plant as food for all the wild animals, the birds in the sky, and the small animals that scurry along the ground—everything that has life.” And that is what happened." Interesting wording. I did a little research. Apparently, when the word “meat” is used in the KJV, it doesn't mean the flesh of an animal. The word “meat” here in its original Hebrew is the word oklah, which meant food in general. Later, the English word “flesh” is introduced to mean what we in modern times call “meat”. It's the same way in the New Testament, when the author of Hebrews talks about growing up and going from milk to eating meat; the words meat and bread are used interchangeably to mean solid food or victuals and flesh is used to describe animal protein. And of course they wouldn't eat animals. This was before the Fall, before the first sin opened the doorway to Death. There was no dying, no killing. It says even the wildest of animals ate green plants, so they didn't kill each other. Death simply did not exist. But after Adam and Eve disobeyed God, we were cursed with death. (And that makes sense, too, because as we learn in the New Testament, the consequences of sin is always death, Romans 6:23.) Death was never part of God's original plan; that was the result of our human disobedience and sin. "Every moving thing that lives shall be food for you. And as I gave you the green plants, I give you everything. But you shall not eat flesh with its life, that is, its blood." Maybe he was trying to get things back to normal. However, after this point, the Bible is filled with animal sacrifices, hunting and eating wild game, and rules about eating clean animals. There are even references to Jesus eating lamb and fish. So, the Bible makes it quite clear that it's okay to eat animals. That said, there's some interesting tidbits throughout the rest of the Scriptures. Take the book of Daniel, for instance. Daniel is one of the young men selected to serve in the royal palace of King Nebuchadnezzar. In return for their service, the men are given daily rations of the finest, richest foods and wines from the king's own kitchens. "Daniel spoke with the attendant who had been appointed by the chief of staff to look after Daniel, Hananiah, Mishael, and Azariah. “Please test us for ten days on a diet of vegetables and water,” Daniel said. “At the end of the ten days, see how we look compared to the other young men who are eating the king’s food. Then make your decision in light of what you see.” The attendant agreed to Daniel’s suggestion and tested them for ten days. At the end of the ten days, Daniel and his three friends looked healthier and better nourished than the young men who had been eating the food assigned by the king. So after that, the attendant fed them only vegetables instead of the food and wine provided for the others." Hmm. Daniel was a vegetarian by choice, because he knew it was better for his and his friends' health. Surprised to find that in the Bible? I certainly was. "One person believes it’s all right to eat anything. But another believer with a sensitive conscience will eat only vegetables. Those who feel free to eat anything must not look down on those who don’t. And those who don’t eat certain foods must not condemn those who do, for God has accepted them. Who are you to condemn someone else’s servants?" "I know and am convinced on the authority of the Lord Jesus that no food, in and of itself, is wrong to eat. But if someone believes it is wrong, then for that person it is wrong. And if another believer is distressed by what you eat, you are not acting in love if you eat it. Don’t let your eating ruin someone for whom Christ died." "Remember, all foods are acceptable, but it is wrong to eat something if it makes another person stumble. It is better not to eat meat or drink wine or do anything else if it might cause another believer to stumble. You may believe there’s nothing wrong with what you are doing, but keep it between yourself and God." It's interesting. Paul ends up saying it's a matter of choice and personal convictions. Something you need to talk to God about and decide for yourself. That's kind of a running theme throughout the Scriptures, isn't it? Choice. Sure, there are laws and instructions, but God gave us free will. It's all up to us and what happens within our hearts. 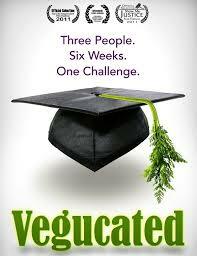 As far as vegetarianism goes, the weight of the choice didn't mean much to me until I watched Vegucated, a documentary on Netflix. The film was about three meat-loving New Yorkers who volunteer to go vegan for six weeks. Sounded worthwhile. I love a good documentary, and I thought it'd be good for me to see since I've been toying with the idea of going meatless for a while. It was all fun and entertaining until they showed slaughterhouse footage. They began describing routine procedures that go on inside their walls each and every day to make sure we Americans have more than enough meat and dairy. The horror of it brought me to tears. Animals jammed together, piled on top of each other so densely the ones on the bottom smother to death. The tiny necks of male chicks being snapped, one after another as they're jerked off a conveyer belt, just because they're male and can't lay eggs. That makes them “useless”. Their bodies get tossed to the floor or dumped in the trash. Piglets being castrated by a human hand, completely conscious, with no anesthesia or drugs at all, writhing and squealing in pain. The beaks of chickens burned off the same way to keep them from pecking the others to death. Female cows being artificially inseminated, over and over again, so they can stay pregnant constantly, all so we can milk them and milk them and milk them until they collapse from exhaustion. That's not even the worst of it. That's only skimming the surface. I felt this horrible, deep ache in my gut after I finished the film. How did I not know about this? How is this even legal? You might expect these things to go on in some shady area of China or some far away place. Not the United States! I went online to see what else I could find. I sought Christian resources, because this seemed like something we Christians should be standing up against, right up there with the biggies like abortion and gay marriage. I didn't find much from a Christian viewpoint. But I did find the documentary Earthlings. I could barely watch it. I sobbed continually, but I forced myself to keep watching because I knew I needed to see it. I made it to the end, and as the credits rolled, I felt my life had been changed forever. I couldn't unsee the monstrosities I'd just witnessed. I couldn't believe that I've grown up without being told how appallingly animals are treated, all so we can eat them or make clothes out of them or be entertained by them at a rodeo or a circus or a zoo. We don't care about the pain or suffering we're inflicting, all for things we could do without. If we do care, we pretend we don't. We smother those feelings, we push them out of our minds, so we can keep living a “comfortable” life. Because we like hamburgers. Leather jackets and handbags are a status symbol. We take our children to see the animals at the circus or the zoo. We don't want to change our ways. The thought made me disgusted and angry at people, especially Christians. How can we ignore this? How can we pretend this cruelty doesn't exist? How can any person who seeks to please God and follow Jesus's example willingly and knowingly choose to support or partake in something so horrendous? And I've been right there in the middle of it all, eating burgers and BBQ and bacon, trying not to think too hard about what it is I'm actually putting in my mouth. But now, after seeing that, how can I continue to do that? "You say, “I am allowed to do anything”—but not everything is good for you. You say, “I am allowed to do anything”—but not everything is beneficial." And we need to put some things in perspective. When God gave Noah those first instructions to eat animals, it was a different time and a different culture. The people of antiquity had limited resources. After the flood, there were famines and droughts. God allowed people to eat animals so that His children could live on, because He loves humans and doesn't enjoy watching them suffer. When crops failed and plants withered, there was nothing else to eat, and people had to eat their animals to survive. I'm an American in the 21st century. I am less than five miles away from four different grocery stores, each one heaped with fresh fruits, vegetables, and grains. All of these foods, even exotic ones that have been shipped in from different places across the globe, are here at my disposal. As an Alabamian, if I had been born a few years earlier, I would never have seen a kiwi or a pineapple or a mango or an avocado or kale. But now, I have all these and so much more. And they're not only available to the rich; I make barely more than minimum wage, and I can eat anything I want! So how could I, knowing all of this, buy a pound of ground beef, a pack of chicken breasts, or a pork tenderloin? If I do that, I support the meat industry that is torturing and murdering living creatures that can experience fear and feel pain. And I don't even need that meat! Maybe Jesus wasn't a vegetarian when He became a man two thousand years ago, but if He walked these roads today, I don't believe He would turn a blind-eye and eat the steroid-pumped products of modern American slaughterhouses. I just don't. I believe the gruesome truth would turn His stomach, break His heart, stir compassion, and move Him into action. That's what I've felt in my own heart. 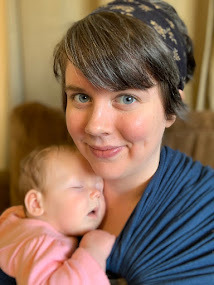 As far as action, I'm sharing my story here. I am eliminating meat from my diet. I wish there was more I could do, but right now, I am at a loss. I hope that you will now pause and re-evaluate your own belief system and reasons for eating or not eating meat. 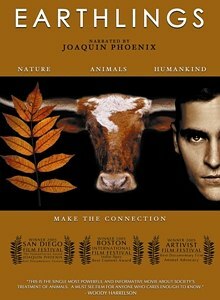 As difficult as it is, I recommend viewing Earthlings (on YouTube, here) or at least Vegucated (on Netflix Instant). I hope you will take some time to reexamine the verses I've mentioned for yourself, to spend some time alone with God in quiet contemplation. To talk to Him, to ask Him what He wants you to do in your own life. "But if you have doubts about whether or not you should eat something, you are sinning if you go ahead and do it. For you are not following your convictions. If you do anything you believe is not right, you are sinning." Jennifer, I applaud you! This was so eloquently written and extremely convicting, even though I am already vegetarian. What you wrote is truth and I am so proud of you for speaking out on such an unpopular subject. I think there's a reason why nobody has commented on this, it's such a hard thing to allow ourselves to overcome. I will be linking to this post sometime soon, it was so moving. Thanks again for sharing and I am definitely going to check those documentaries out soon. Thank you so much, Lacey. I really appreciate your encouragement on this post. I have to admit, I was quite disheartened to get no feedback after all the thought and effort and heart I put into writing this. But what can you really expect? Nobody wants to read this. Thanks again for taking the time to read it and for responding with such kindness. Thanks for the article. I respect your views on food and your food choice (especially even after being raised in a culture that loves meat). I am 30 years old, never ate meat/fish/beef no nothing that's derived from killing/torturing animals. There are a lot of references in Hindu scriptures about vegetarian food and why there can not be real spiritual progress without making vegetarian food choices. Hi. I had struggled all my adult life with eating meat, usually leaving it to one side of the plate and unable to relate to the terrible treatment of farm animals, just to cosset and love my two dogs? I was today able to relate to everything you said and it has put things in perspective for me. I believe I can now move on as I have wished to and learn and embrace a vegetarian lifestyle. It feels right to me and I understand more why I struggled. Thanks for taking the time to put your journey down for us to share. Regards Julie, Kent, UK.